North Wales High School Emrys ap Iwan commissioned local security and IT specialist Spider Technologies to research a replacement solution for their exhausted swipe card system. After extensive investigation Spider Technologies recommended none other than the robust ievo ultimate fingerprint reader. Specialising in ICT and Electrotechnical Services, Spider Technologies has been providing PAT Testing, Bespoke Software and Digital Signage installation alongside access control management since 2005. Driven by a strong technical background, Spider Technologies quickly became a registered Paxton installer in order to provide easy to use yet performance driven security solutions. 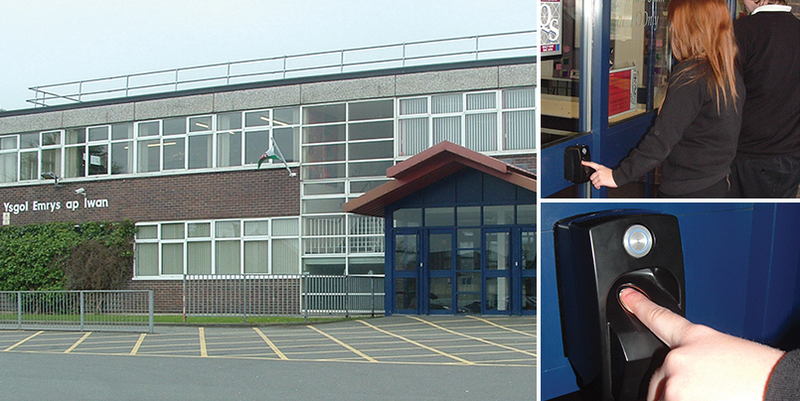 Spider Technologies was initially approached by Emrys ap Iwan before IFSEC – the International Fire & Security Exhibition – to investigate fit for purpose and robust access control solutions that would be used to replace their original swipe card system that was causing them problems at the school. After attending IFSEC and researching each possible solution, Managing Director of Spider Technologies Steve Jones decided upon the ievo ultimate fingerprint reader as it stood out from the crowd at the security event, mainly due to its capabilities and indisputable reliability. After receiving a one to one demonstration with one of ievo’s account managers in August 2011, Steve quickly made an order of multiple ievo ultimate readers which he would later install at the school to be activated as early as September, just in time for the next academic year. The school previously used a swipe card system, where approximately 250 sixth form pupils and 100 teaching staff would gain access between different points around the building. Not only was the system difficult to maintain but it became increasingly expensive to run because pupils kept losing their cards. All the ievo ultimate readers secure and monitor access on entry points between two main school buildings, which enables further control over sixth form pupils and the remainder of the school year groups. There were three main reasons why the ievo ultimate fingerprint readers increased efficiency, security and reduced the cost of maintenance at the school. Three main advantages were established as to why the ievo ultimate biometric reader won the staff and parents vote. 1. Firstly, using the ievo ultimate reader permitted school management to control access rights between the two separate buildings on the grounds. Using Paxton’s market leading access control system, Net2, Emrys ap Iwan management are able to control what times each year group enter each school building. The buildings are accessible by all pupils however some parts are designated for staff and sixth form only, such as main entrance and access to an adjoining further education college on one of the sites. Access levels are therefore granted to sixth form pupils and staff continuously whilst remaining year groups gain access to general exterior doors between five minute lesson changeovers only..
2. Secondly, management at the school were worried about vandalism, which is why one of their requirements was a robust access control product that would be able to function in any adverse environment. At Emrys ap Iwan the ievo ultimate reader was installed on main external doors, which caused no problems for the robust reader. ievo ultimate is manufactured in Polycarbonate ABS and the fingerprint sensor is encased within toughened glass. In addition it is IP 65 rated meaning it will function with water and is dust tight. 3. Finally, they required a security system that would be up and running within a short period of time. Therefore, ease of use and usability played a major factor. The registration process of enrolling and training the pupils and staff on how to use the system took around two days. End user guides and posters were supplied with each reader so that there was no confusion on how to use the product. The guides also provide information on data protection, this was useful for parents or guardians of young adults being registered. *Information will not be shared with third parties nor ievo Ltd marketing and will only be used for an ievo employee to respond to your query.